McCain and Giuliani head up the Republican pack chasing the presidency. Clinton, Obama and Edwards lead the chase for the Democratic nomination. 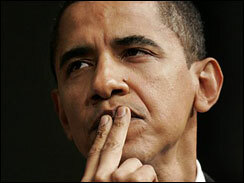 (AP) Democratic presidential candidate Barack Obama may have a lot of explaining to do. He voted against requiring medical care for aborted fetuses who survive. He supported allowing retired police officers to carry concealed weapons, but opposed allowing people to use banned handguns to defend against intruders in their homes. And the list of sensitive topics goes on. With only a slim, two-year record in the U.S. Senate, Obama doesn't have many controversial congressional votes which political opponents can frame into attack ads. But his eight years as an Illinois state senator are sprinkled with potentially explosive land mines, such as his abortion and gun control votes. Obama — who filed papers this week creating an exploratory committee to seek the 2008 Democratic nomination — may also find himself fielding questions about his actions outside public office, from his acknowledgment of cocaine use in his youth to a more recent land purchase from a political supporter who is facing charges in an unrelated kickback scheme involving investment firms seeking state business. Obama was known in the Illinois Capitol as a consistently liberal senator who reflected the views of voters in his Chicago district. He helped reform the state death penalty system and create tax breaks for the poor while developing a reputation as someone who would work with critics to build consensus. He had a 100 percent rating from the Illinois Planned Parenthood Council for his support of abortion rights, family planning services and health insurance coverage for female contraceptives. One vote that especially riled abortion opponents involved restrictions on a type of abortion where the fetus sometimes survives, occasionally for hours. The restrictions, which never became law, included requiring the presence of a second doctor to care for the fetus. "Everyone's going to use this and pound him over the head with it," said Daniel McConchie, vice president and chief of staff for Americans United for Life. Obama spokesman Robert Gibbs said voters will be able to judge distorted accounts of his votes against his legislative career in general. "I don't doubt that if you take a series of votes and twist them and kind of squint, you can write a narrative the way you want to write it," Gibbs said. "I think what people understand is that (what matters) is taking the full measure of his career and the full measure of his legislative efforts." Abortion opponents see Obama's vote on medical care for aborted fetuses as a refusal to protect the helpless. Some have even accused him of supporting infanticide. Obama — who joined several other Democrats in voting "present" in 2001 and "no" the next year — argued the legislation was worded in a way that unconstitutionally threatened a woman's right to abortion by defining the fetus as a child. "It would essentially bar abortions because the equal protection clause does not allow somebody to kill a child, and if this was a child then this would be an anti-abortion statute," Obama said in the Senate's debate in March 2001. During his 2004 run for U.S. Senate, Obama said he supported similar federal legislation that included language clarifying that the measure did not interfere with abortion rights. Such hot-button issues were the exception in a legislative career that focused more on building consensus to improve the justice system and aid the poor. Gibbs noted Obama's leadership on legislation requiring police to videotape interrogations in murder cases. It started out as a controversial idea but ended up passing the Senate unanimously. Allies and opponents alike say he listened to those who disagreed, cooperated with Republicans and incorporated other people's suggestions for improving legislation. "He was looked upon by members of both parties as someone whose view we listened carefully to," said Republican state Sen. Kirk Dillard from Hinsdale, Ill.
"It's bad politics to be on the wrong side of the Second Amendment come election time," said Wayne LaPierre, executive vice president of the National Rifle Association. "It will certainly be talked about. You can take that to the bank." On the other hand, Obama parted company with gun control advocates when he backed a measure to let retired police officers and military police carry concealed weapons. Obama occasionally supported higher taxes, joining other Democrats in pushing to raise more than 300 taxes and fees on businesses in 2004 to help solve a budget deficit. The increases passed the Senate 30-28. That's one reason Illinois business groups gave Obama a low rating, while labor groups praised him. But even Obama's allies say he refused to become a rubber stamp for their legislation. "He always wants to understand an issue and think it through," said Roberta Lynch, deputy director for Council 31 of the American Federation of State, County and Municipal Employees. "You have to make your case no matter who you are." For six years, Obama served in a Republican-controlled Senate, so he and fellow Democrats only got a fraction of their bills signed into law. During his last two years, Democrats controlled the chamber and he was the go-to guy on a variety of issues. He helped pass legislation overhauling Illinois' troubled capital punishment system and was a key figure in requiring a massive statewide study of traffic stops to look for signs of racial profiling. Although police groups opposed the legislation, they say Obama listened to their concerns and accepted some of their suggestions to improve the bill. Even when he was in the political minority, Obama sometimes played a critical role. He helped write one of the rare ethics laws in a state known for government corruption and worked on welfare reform with Republicans. He sponsored legislation to bar job and housing discrimination against gays, and he helped create a state version of the earned income tax credit for the poor. Obama also led efforts to reject federal rules that would have put workers' overtime checks in jeopardy. Helped pass a 5 percent earned-income tax credit for low-income working families in 2000; made the credit permanent in 2003. Successfully sponsored move to shield Illinois workers from federal rules that threatened overtime pay for some employees. © MMVII The Associated Press. All Rights Reserved. This material may not be published, broadcast, rewritten, or redistributed. Bill Clinton "Just Can't Help Himself"
Food Shortages Herald "New Era Of Hunger"
Tammarie Jones was working the graveyard shift at a local motel when a knife wielding thug attacked her. She was stabbed three times and sent to hospital for recovery. KIRO's Kyle Moore reports. Hillary Clinton's Bosnia blunder has already cost her campaign a lot of credibility. So why would Bill Clinton bring it up while stumping for her in Indiana? Bob Schieffer weighs in.